Dame Sian Seerpoohi Elias GNZM PC QC (born 13 March 1949) was the 12th Chief Justice of New Zealand, and was therefore the most senior member of the country's judiciary. She was the presiding judge of the Supreme Court of New Zealand and on several occasions acted as Administrator of the Government. Born in London of an Armenian father and a Welsh mother (hence her Welsh forename and Armenian surname), Elias attended Diocesan School for Girls in Auckland. She completed a law degree from the University of Auckland in 1970, and then undertook further study at Stanford University. She took up employment with an Auckland law firm in 1972, beginning her career as a barrister three years later. She also served as a member of the Motor Spirits Licensing Appeal Authority and of the Working Party on the Environment. Elias is married to Hugh Fletcher, former CEO of Fletcher Challenge and a former Chancellor of the University of Auckland. In 1994, her brother-in-law, Jim Fletcher, was stabbed to death by an intruder in his Papamoa beach house. Elias served as a Law Commissioner from 1984 to 1988. She is also known for her work in relation to various Treaty-related cases. In 1990, she was awarded a New Zealand 1990 Commemoration Medal in recognition of her services. In 1988 she and Lowell Goddard were made the first women Queen's Counsel in New Zealand. Elias became a judge of the High Court in 1995, and occasionally sat on the Court of Appeal. 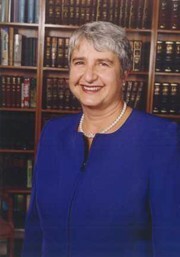 On 17 May 1999, Elias was sworn in as Chief Justice of New Zealand, the first woman to hold that position in New Zealand. One aspect of the role of Chief Justice is the role of Administrator of the Government when the Governor-General is unable to fulfil their duties (due to a vacancy in the position, illness, absence from New Zealand or some other cause). Elias has held the position of Administrator of the Government from 22 March 2001 until 4 April 2001, between the terms of Sir Michael Hardie Boys and Dame Silvia Cartwright, from 4 August 2006 until 23 August 2006 between Cartwright's term and that of Sir Anand Satyanand, from 23 August 2011 until 31 August 2011 between the terms of Satyanand and Sir Jerry Mateparae, from 31 August 2016 until 28 September 2016 between the terms of Mateparae and Dame Patsy Reddy, and at other times when the Governor-General has been unable to act. In 1984, Elias helped Ngāneko Minhinnick's Manukau Harbour claim to the Waitangi Tribunal. This led to work on other treaty cases, including as counsel in New Zealand Maori Council v Attorney-General, and in a claim to prevent the Government selling radio frequencies, and the case challenging the 1994 Māori electoral option. In June 2003 she was involved in a landmark case which allowed for the possibility that the Māori Land Court could issue freehold title over the foreshore and seabed. The subsequent legal uncertainties and upheavals in Māoridom dominated the political agenda for the next 18 months. In July 2009 Elias caused controversy with her remarks in the annual Shirley Smith address, organised by the Wellington Branch of the New Zealand Law Society's Women-in-Law committee. The annual lecture is given in honour of noted criminal defence lawyer, Shirley Smith. The speech was entitled "Blameless Babes" after a quote from Smith, who wrote "[providing] a prison at the bottom of the cliff is not a solution. Criminals will just go on falling into it, at great cost to the community. We have to find out why blameless babes become criminals." In her speech, Elias expressed concern about prison overcrowding and argued against what she described as the "punitive and knee-jerk" attitude of politicians towards the criminal justice system. She said prison overcrowding had to be managed to prevent "significant safety and human rights issues". She also said several other changes were needed in the criminal justice system including increased education and understanding by the community that, since "criminal justice processes are largely irrelevant to crime reduction", we need to address the causes not just the effects of crime. She said New Zealand needed greater focus on early intervention for youth and vulnerable families, improved mental health and drug and alcohol treatment, greater use of community-based sentences, and a fundamental rethink in the way the probation service monitors offenders. As a final point, Elias said that unless New Zealand takes action to address the underlying causes of crime, Government may be forced into the position of using executive amnesties to reduce the growing number of prisoners. The Chief Justice's comments were widely reported in the media. Simon Power, the Minister of Justice, said in response: "The Chief Justice's speech does not represent Government policy in any way, shape or form". ^ "Elias—top judge and judicial activist". The New Zealand Herald. 28 March 2005. Retrieved 5 August 2010. ^ Woods, Angela (20 October 2017). "Women in charge: Female Governor-General, Chief Justice and now PM". The New Zealand Herald. Retrieved 22 December 2017. ^ Shirley Smith "Kneejerk reaction" The Dominion (17 November 1999, ed 2, 12). ^ Dame Sian Elias (9 July 2009). "Blameless Babes—2009 Shirley Smith Address" (PDF). The New Zealand Herald. This page was last edited on 16 March 2019, at 23:34 (UTC).